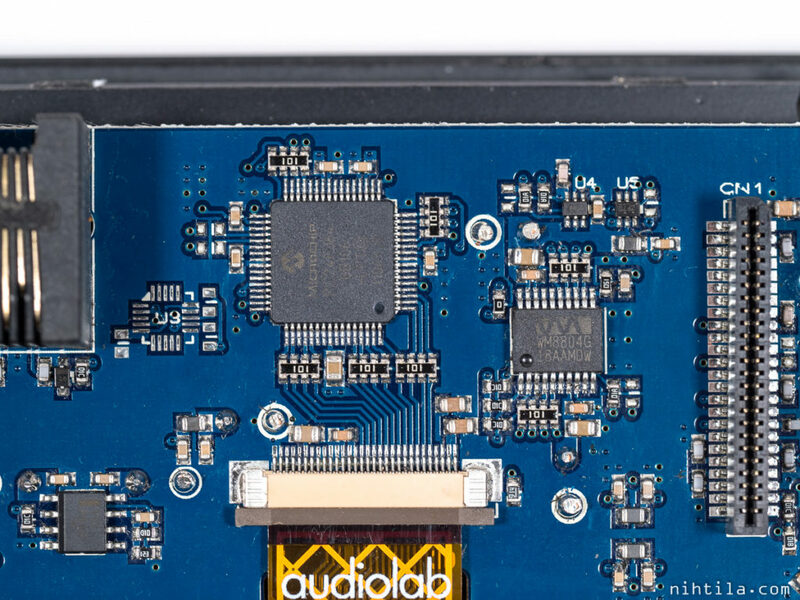 Audiolab M-DAC is one of those DACs that caused a lot of buzz among hifi crowds when it was released in 2011. It was highly praised in its price category of around £600 and won awards by What Hi-Fi, Hi-Fi Choice, and EISA. Moreover, at the moment it can be bought new for £470 at Richer Sounds – I got my second hand unit even a lot cheaper off eBay. Anyway, M-DAC is clearly a good reference as it is highly acclaimed in the industry. 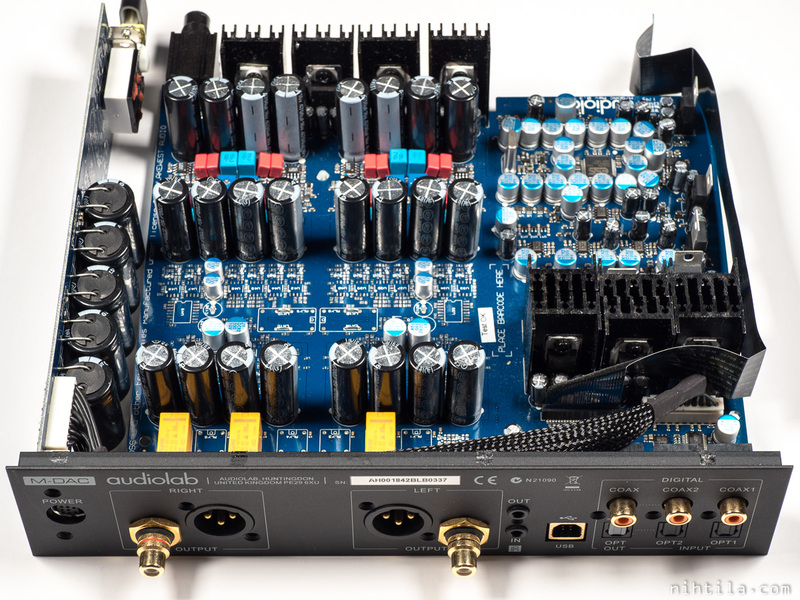 M-DAC was designed by John Westlake, a well-known audio designer who has designed electronics for Cambridge Audio, Audiolab, Quad, Pro-Ject, and Creek. 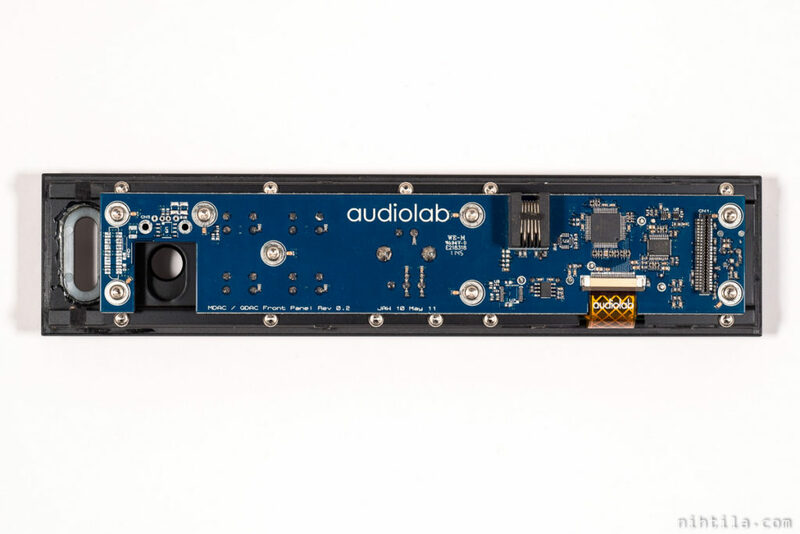 I have not been following the threads in Pinkfish media forum where Mr. Westlake has been active but what I understood, he designed the original M-DAC slightly different and obviously more expensive to manufacture, and Audiolab have been understandably cut the corners a bit. 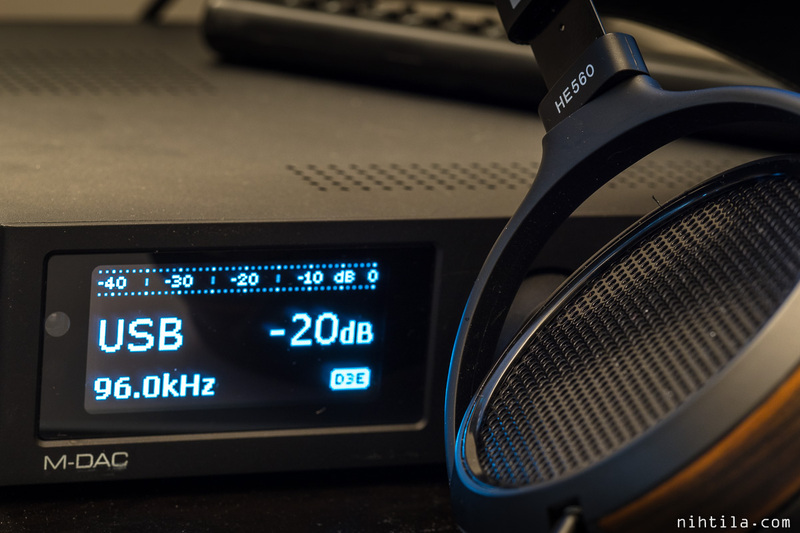 Therefore, the more expensive successor M-DAC+ was released few years later. And after that Westlake has been working on his crowdfunded projects. Something worth mentioning is that John Westlake kept upgrading the firmware of the M-DAC under his own name, or his own company West Lake Audio, after he was not working with Audiolab anymore. 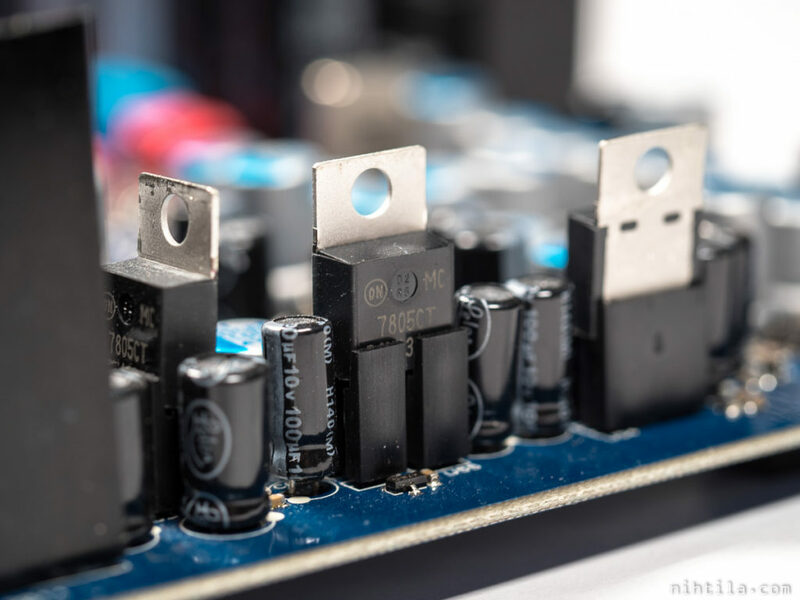 There is an M-DAC Wiki page where you can find some information and all the released firmware versions. Long story short(er), you can find all information on M-DAC online when you just google it. 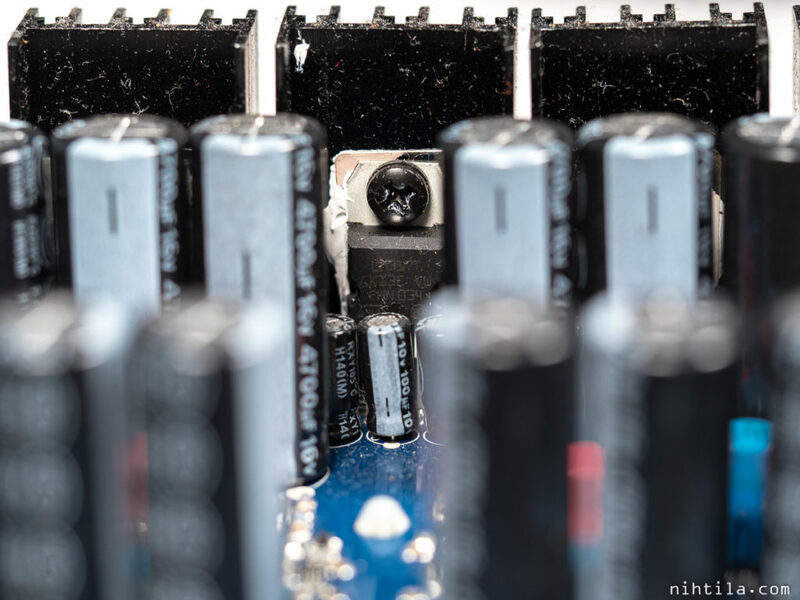 This teardown is not an extensive reverse-engineering or analysis but more like a glimpse what’s inside with lots of photos. After all, an audio engineer is very interested in seeing inside a successful commercial product. I will also do performance measurements at a later time. 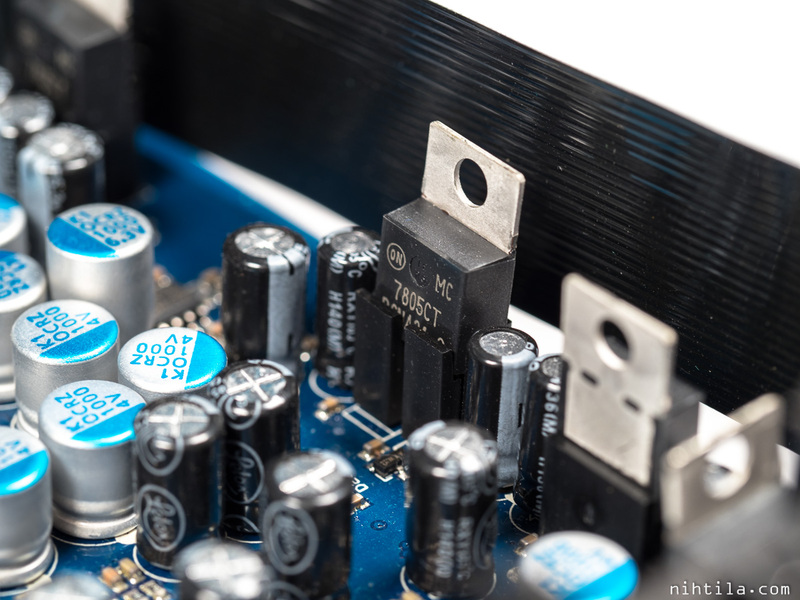 Besides basic analog performance measurements, I am also interested in trying to find differences between the several digital filter options M-DAC offers. 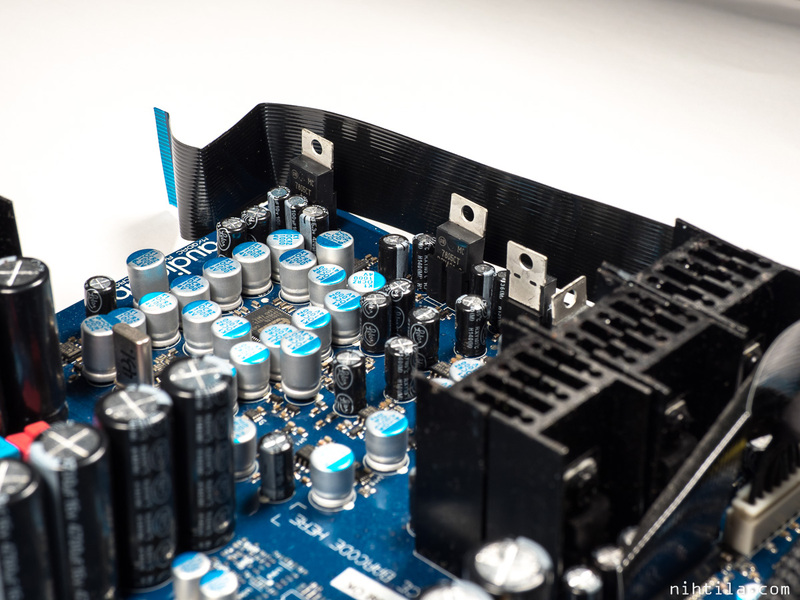 After the case is removed, a pretty busy and large PCB is revealed. 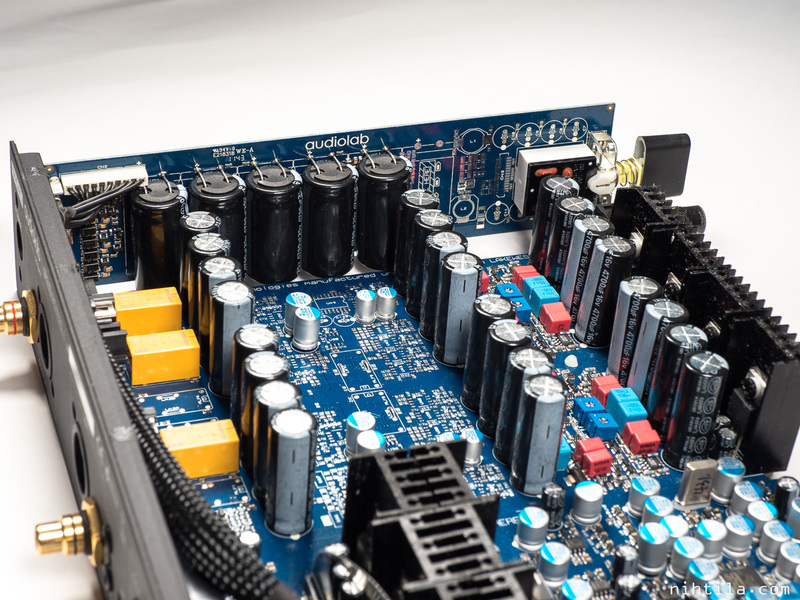 The vertical PCB to the left contains some main power supply components. Front panel PCB has been removed and is shown at the end. The photo below is uploaded in high resolution so can be zoomed in more. 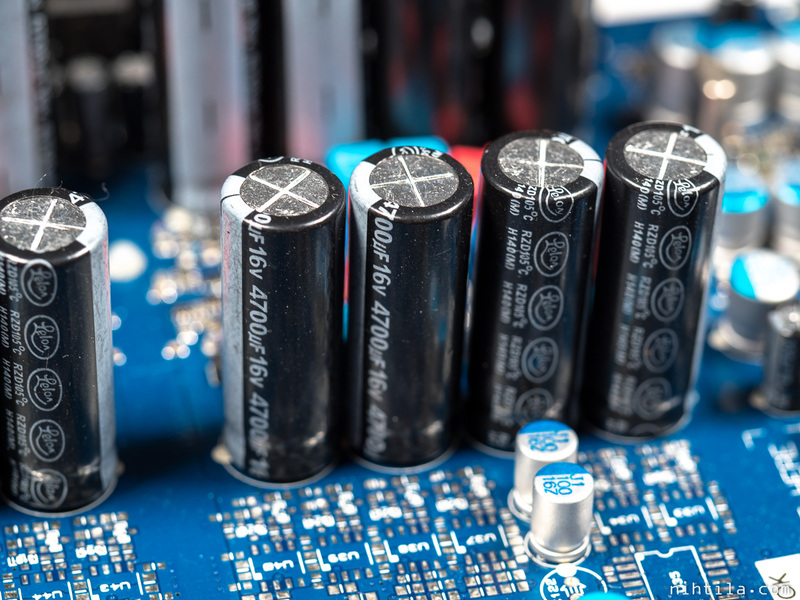 Some serious number of electrolytic capacitors inside! 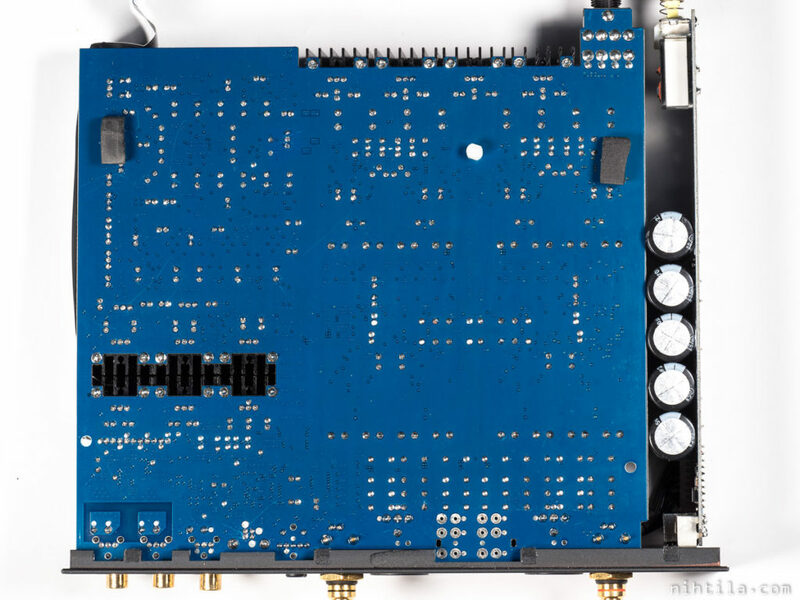 There are lots of components unpopulated, wonder what was designed to be there. 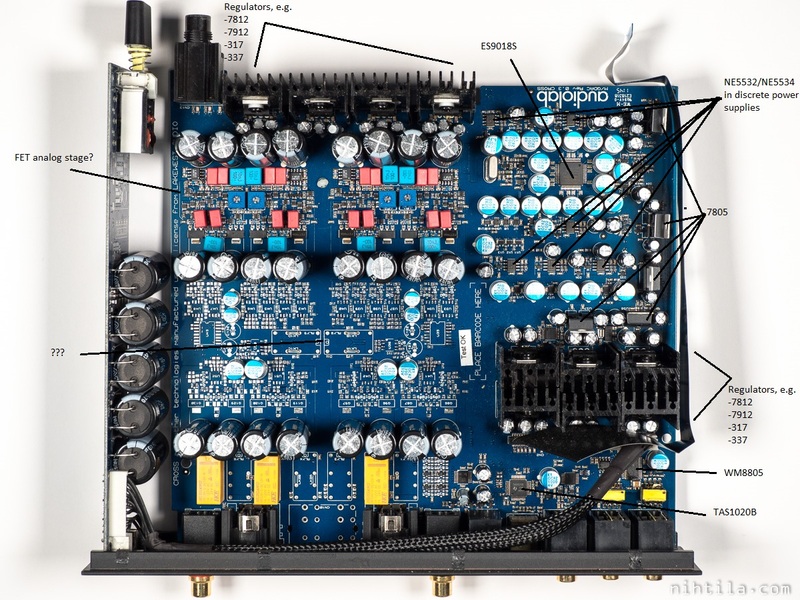 Even more complicated or additional analog stage? It is located just before the output connectors. 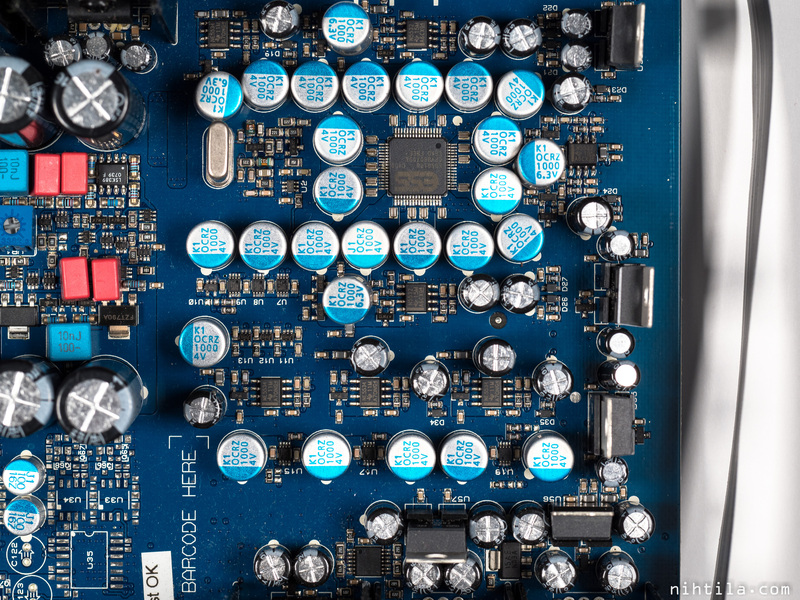 Many components are quite basic (which I in a way find positive, and to be honest you can’t afford anything exotic at this price point) but there are lots of them, by no means this is a cheap board to manufacture. 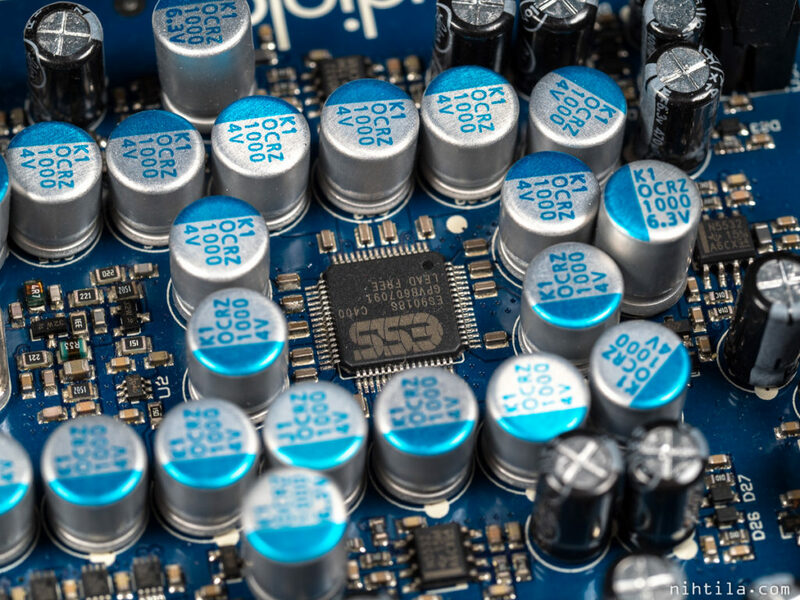 ES9018 DAC – very high quality, popular, and famous DAC. Not easy to get as it is not sold by any distributors and you need to contact ESS and sign an NDA to even get the datasheet. Just a note that you can find some versions of the schematics when you just type it in Google, lacking the analog stage though. And that part probably have a lot to do with the sound quality of this thing. We can see that the components there differ from the rest; there are some different looking resistors, through-hole plastic capacitors, FETs, and trimmer resistors. 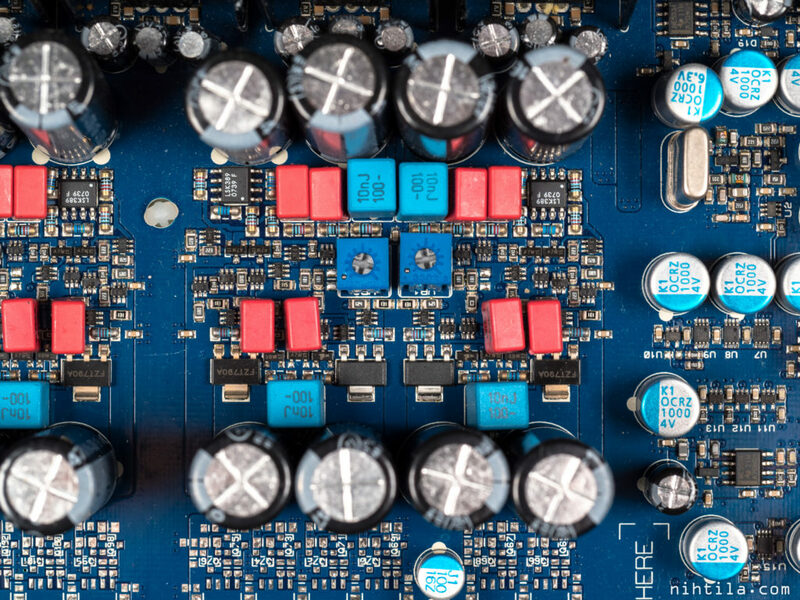 Discrete analog output stage with FETs? 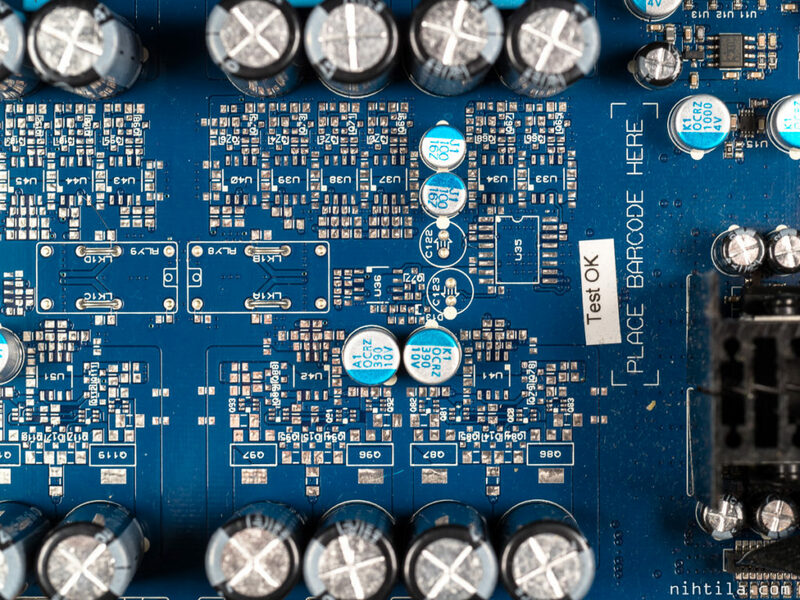 Below is the front panel PCB. There is a PIC24FJ64 but also WM8804 which is an S/PDIF transceiver. I have no idea what it is doing there. There can be some tricks going on from the USB input. 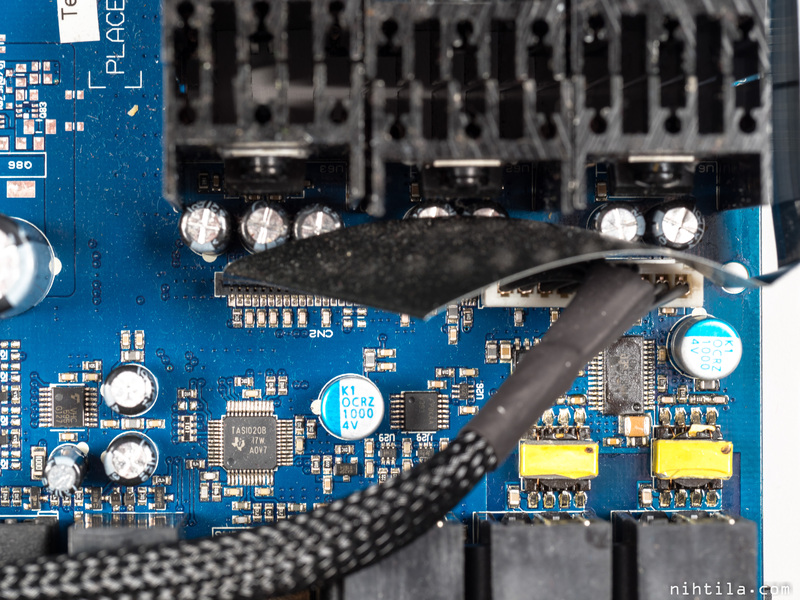 Another thing with USB is that it is not only a digital input but also an interface to update the firmware. What is WM8804 doing here? Measurements will follow later. Stay tuned! I’m looking forward to the measurements! Can you measure the beast with your AP?